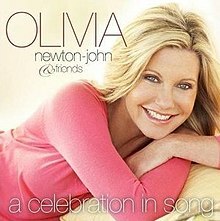 A Celebration in Song is the twenty-fourth studio album by the Australian pop singer Olivia Newton-John, released on 3 June 2008 by Warner Bros. in Australia. The worldwide release of the album was by EMI, on 2 September 2008. It is her second duets album, following (2), released in 2002 by Festival Mushroom. On 25 January 2011, the album was re-released by Spring Hill with a new cover. The album was released in conjunction with Newton-John's walk to Beijing which, together with this album, raised funds for the future The Olivia Newton-John Cancer and Wellness Center in Melbourne, Australia. The songs "Never Far Away" (with Richard Marx) and "Sunburned Country" (with Keith Urban) originally belong to Newton-John's 2002 duets album, (2). The song "Beautiful Thing" was taken from Belinda Emmett's album So I Am and the track is "dedicated with love" to her. Guy Sebastian and Olivia Newton-John performing "Summer Nights" at the concert. The Olivia Newton-John and Friends: Gala Fundraising Concert was a one-night only concert based in the album. The concert was held at the State Theatre in Sydney on 30 September 2008 to raise funds for the Olivia Newton-John Cancer and Wellness Centre Appeal. ^ "Australian release of "A Celebration in Song"". Amazon. ^ "Worldwide release of "A Celebration in Song"". Amazon. ^ a b "Only Olivia: (2)". ^ "Spring Hill's release of "A Celebration in Song"". Amazon. ^ a b c "Only Olivia: A Celebration in Song". ^ "Only Olivia: Gala Concert". This page was last edited on 19 December 2018, at 09:39 (UTC).